Winnie-the-Pooh 1 By A.A. Milne Review! Winnie-the-Pooh (1996) by A.A. Milne is a brilliant counting book featuring Winnie alongside regular pals Piglet, Christopher Robin and Eeyore. Each page of this book we meet a new character and there is many intriguing adventures in this book including a trip to the North Pole. It is both a storybook and an informative book. This book also helps young children with their counting in a fun way through stories so they can learn this valuable skill of counting in an enjoyable way without pressure. Through objects, the symbol and the word in the book, children learn how to count and it is did in a very accessible way. The book is also wonderfully illustrated by Ernest H. Shephard which really adds much magic to the book. Witty, joyful and charming, this book is brilliantly imaginative with great characters. My personal favourite is Piglet who I find to be a lovable little nerd. A great book for children and adults alike. This book is a wonderful timeless book which is beautifully constructed. 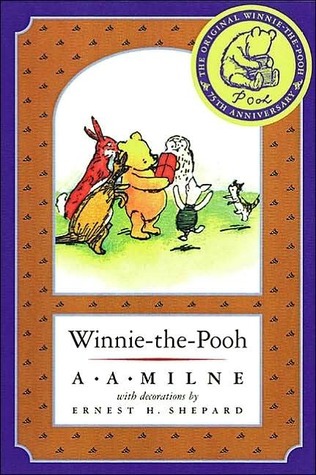 This entry was posted in Books and tagged A.A Milne, A.A. Milne Books, Books, E.H. Shepard, E.H. Shepard Books, Winnie-the-Pooh, Winnie-the-Pooh 1 by A.A. Milne, Winnie-the-Pooh by A.A. Milne. ← 6 Stream of Consciousness Saturday prompts! Well, Jemima Puddle Duck, was my personal favorite. I agree. While I didn’t read them as a child, my daughter did and absolutely loved Winnie The Pooh.